Fabio Biondis immense curiosity for characterful music especially of forgotten scores from the Baroque yields another fabulous surprise with Francesco Feos oratorio San Francesco di Sales. Feos reputation is at last starting to wax after having waned dramatically in the nineteenth century and thenceforward: in his own age he was compared very highly with Bach and Handel, and Charles Burney was moved to describe his vocal music as being full of fire and invention and force in the melody and expression of the words; Feo was also a boon companion of Pergolesi. He wrote both operas (such as Siface which had a libretto by Metastasio) and church music, with compositions which demanded significant vocal virtuosity from his performers. 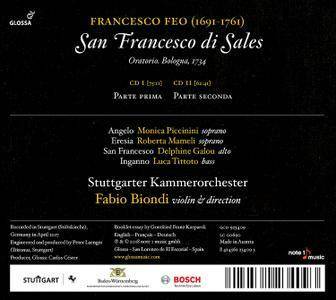 San Francesco di Sales: apostolo del Chablais is a set of reflections and imagery on the work of this inspirational Catholic Bishop of Geneva from the turn of the seventeenth century, and the oratorio probably saw the light of day in 1734. 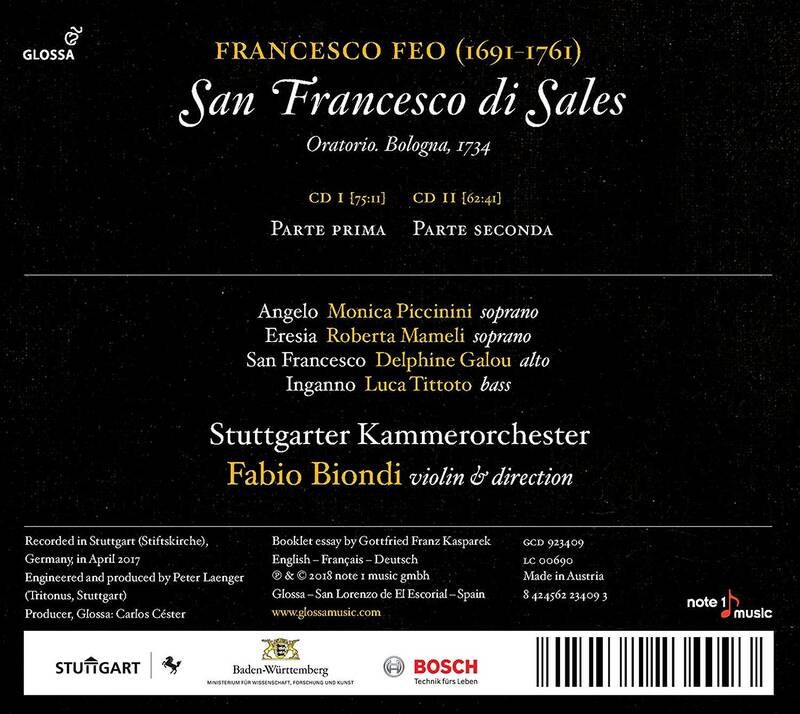 This new release, further evidence of Glossas commitment to the music of the Neapolitan Baroque, presents Fabio Biondi directing the highly-versatile forces of the Stuttgarter Kammerorchester and four of todays brightest and most stylish voices as the oratorios soloists: sopranos Monica Piccinini and Roberta Mameli, contralto Delphine Galou, and bass Luca Tittoto. 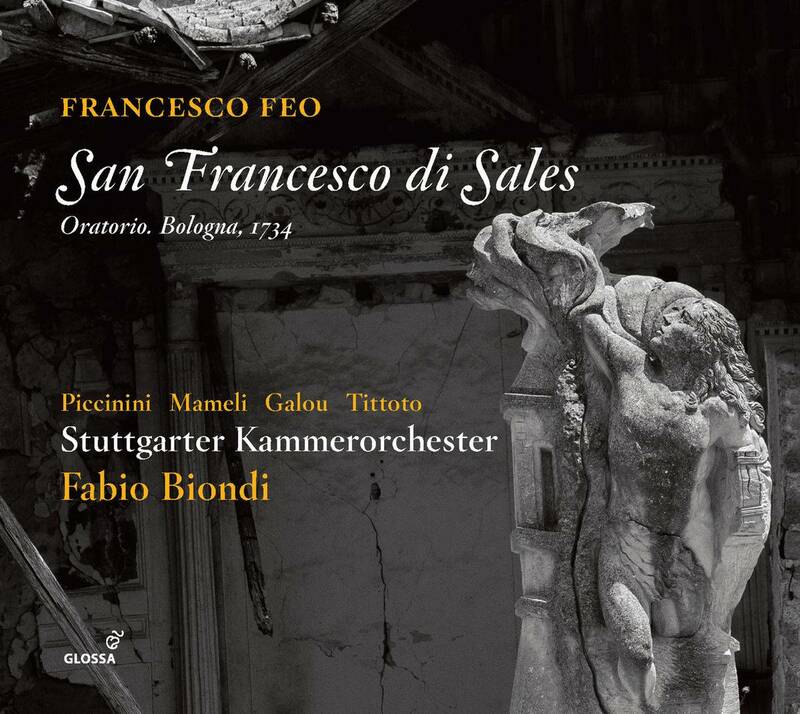 Ample opportunity is also provided in Feos score for instrumental virtuosity, and Biondis own abundant violinistic flair is much to the fore here.